Byaroza (Belarusian: Бяро́за, official Belarusian romanization standard: Biaroza, also Бяро́за-Карту́зская; Russian: Берёза, tr. 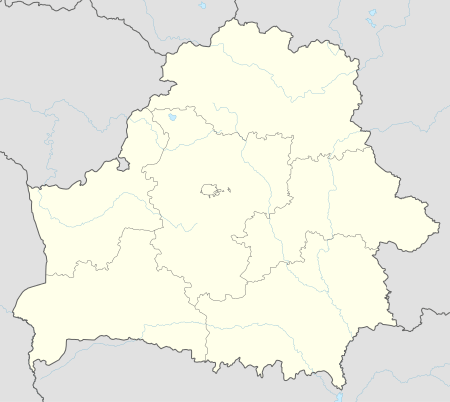 Beryoza; Polish: Bereza) is a town of 31 000 inhabitants (1995) in Western Belarus in Brest Region and the administrative center of the Byaroza District. The village of Byaroza (meaning birch) was first mentioned in 1477 as part of the Slonim paviet. In the 15th century, the village probably received the town charter. Between 1538 and 1600 it was an important centre of Calvinism. Later the town became the private property of the Radziwiłł family. In the 17th century, the village belonged to Sapieha family, who founded a fortified monastery and a palace here. In 1648, the monastery was presented to the Carthusian monks, who came from the Italian town of Treviso and settled here. The pope Alexander VII granted the title of a prince to Lew Sapieha, being thankful for the noble deed. The monastery was also expanded and became one of the biggest charterhouses (Carthusian monasteries) in the Polish-Lithuanian Commonwealth. The Carthusian order gave its name to the second part of the town’s name in the form in which it has been used till late 1940s: Byaroza-Kartuzskaya (Polish: Bereza Kartuska). During the Great Northern War, the monastery housed a conference held by King August II of Poland and Peter I of Russia. In 1706, the fortified monastery was put under siege and then taken by assault and looted by the forces of Charles XII of Sweden. Two years later, the Swedish forces looted the area again, which resulted in almost total depopulation of the town. It was also damaged by the armies of Alexander Suvorov in 1772, during the Partitions of Poland. After the partitions, the town and the monastery were annexed by Russia in 1795. After the November Uprising of 1831 the town was captured by the Russian armies and then looted. The monastery was closed by tsarist authorities and in 1866, after the January Uprising, the whole complex was partially demolished, and the bricks were used for construction of a Russian prison and barracks nearby. The baroque church was destroyed in 1868. After the uprising, the town became a part of the so-called Pale of settlement and was repopulated with Jews expelled from other areas of the Russian Empire. By the 20th century, they constituted more than 70% of the city's inhabitants. In 1842, a new road was opened between Moscow and Warsaw and passed through the town, which started a period of economic prosperity. In 1871, a Warsaw-Moscow railroad was laid only 20 miles (32 kilometres) from the town, connecting the town with the nearby major cities of Brest and Minsk. In 1878, the town had a marketplace, 7 streets and approximately 200 houses. Both the town and the adjoining area had approximately 5,000 inhabitants. Apart from the Catholic and Uniate Churches, there was also a synagogue, Jewish baths and a market just outside the city limits. In 1915, during the First World War, the town was occupied by Germany and in 1918 passed to the short-lived Belarusian People's Republic. The town was captured by the Red Army on January 19, 1919, in the effect of the Target-Vistula offensive. However, on February 10, 1919, the Polish Army entered the area and recaptured the town on February 14. During the Polish-Bolshevik War the town was a battlefield of two notable battles, including the war's first skirmish, (Battle of Bereza Kartuska). After the war the town was annexed by Poland. A Polish political prison camp was created in Bereza Kartuska in 1934. The former tsarist barracks and prison were turned into an internment camp for both Polish right wing extremists from the ONR, Ukrainian separatists from the Organization of Ukrainian Nationalists and members of the Communist Party of Poland and the Communist Party of Western Ukraine, and later also for members of opposition parties, journalists critical of the government and people suspected of common crimes. Inmates were sent there for up to three months without any decision of the courts, based solely on the administrative decision of the police or the voivode. In this way many Belarusians who resisted Polonization found themselves in the Bereza Kartuska camp. The legal basis for the camp opening was openly questioned and its existence was often criticized by opponents of the Sanacja movement, which from its inception called it a "concentration camp". This term was later popularized by post-war Communist propaganda, which depicted it as proof that the government of Poland was a Fascist regime. The camp was closed in September 1939, during the invasion of Poland. In 1939 the town was captured by the Red Army and incorporated into the Byelorussian SSR. After the outbreak of German-Soviet War the town was captured by Germany on June 22, 1941. During World War II, a ghetto was created in the town for Jews rushed there from the surrounding area. More than 8,000 people were killed in mass executions or starved to death by the Germans. After the war, the town was annexed by the Soviet Union and the remaining Polish inhabitants of the town were forcibly expelled. 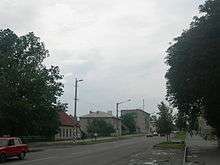 The town was repopulated with Belarusian and Russian peasants, and rebuilt after the damages done by World War II. Also, a minor building materiel factory was opened in the town, which led to yet another period of fast growth. During the postwar period a Soviet aviation military base was placed close to Byaroza. In 1958-1967 a hydroelectric power station was built in the Byaroza Raion. In 1991, after the dissolution of USSR, the town became part of the independent Republic of Belarus. Naftali Levinson 1915 -1919(acting mayor), 1919-1939? Several buildings later incorporated into the tsarist prison. Wikimedia Commons has media related to Biaroza.